11147 OBL CZECHOSLOVAKIA (1936) Scout camp. Cancelation of Zemsky Skautsky Sjezd on piece. 11148 OBL CZECHOSLOVAKIA (1937) Opening of scouts home. 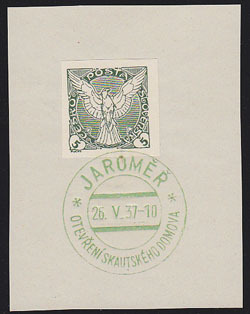 Jaromer cancelation of Otevreni Skautskeho Domova on piece. 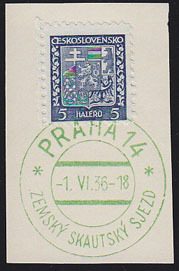 11149 OBL CZECHOSLOVAKIA (1946) Scout emblem*. 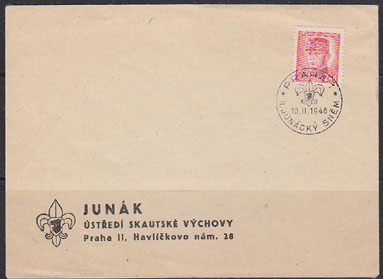 Official envelope with cancelation of 1946 II Junacky Snem Scout Conference and matching cachet.